Examples found at Buttermilk Bend trailhead and at first bridge on wheelchair access trail. 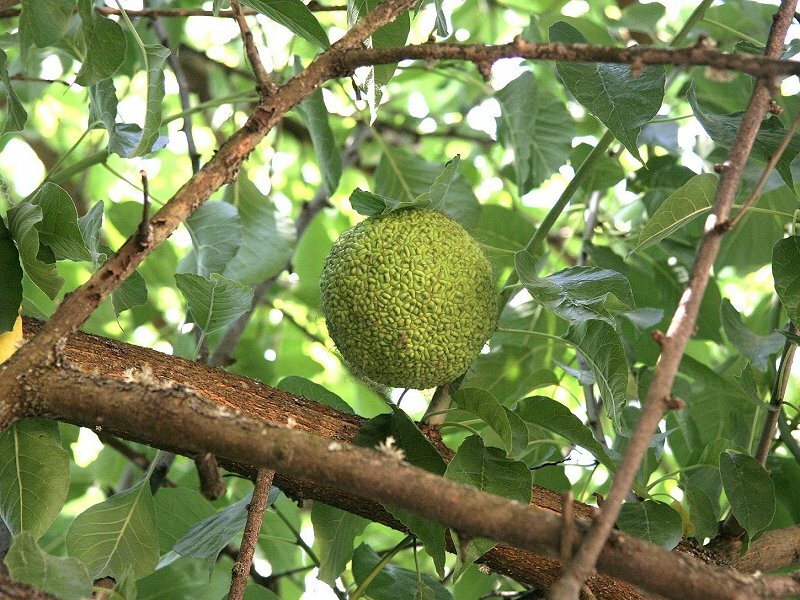 Large, sticky, green, orange-like fruit are conspicuous on the tree and ground. Notes: This tree grows to from 15 to 30 feet tall and was used as one of the first “living fences” to bound prairie farms. The Maidu prized the tough wood for bows and war clubs; now used to a limited extent for posts and ties. It is a relative of the Mulberries and is easily identified by its shiny leaves, thorny twigs and bright orange inner bark. The unusual, wrinkled, orange-like fruit, 4 to 5 inches in diameter, has a typical citrus odor, but the inside is dry and pulpy, with a milky juice. It grows from a ball of small green flowers.